As the audience enters the studio space of Kammer 3, the robot is already sitting on stage and it looks remarkably like Thomas Melle, dressed in a jumper and smart trousers. Melle’s voice emerges from the robot’s silicone mouth as it begins the evening’s lecture, its gesticulations and movements accompanied by soft machine noises. The robot looks perfectly human except for a big hole in the back of its head, exposing machinery and wires. The machine begins to talk about Melle’s life as a manic-depressive writer whilst images and video clips are projected onto a screen. The audience feels empathy but do we feel empathy for the machine in front of us or for Thomas Melle who is present only in his recorded voice? By letting a machine speak for him, Thomas Melle gives up control. Loss of control is the most worrying aspect of Melle’s bipolar disease as it incapacitates him, he is unable to function. Melle was writing a play about Alan Turing, picturing him as a god of a world inhabited by machines, when another manic phase prevented him from completing his work. Because a robot does not have this problem, it could take over for Thomas Melle on various occasions, for example go on his lecture tours. It would be able to repeat the same lecture every night, flawlessly and reliably. Predictability and repeatability are beautiful things. So does only randomness differentiate humans from artificial intelligence? Flaws make us human. Kaegi’s production is highly theatrical. As the machine speaks, the role of the spectator is constantly evaluated and scrutinised. 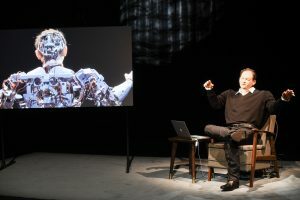 Whereas the performance of the Thomas Melle robot remains the same, the audience adds different algorithms to the evening, making each performance unique. After the performance, the machine is cordoned off but the audience is allowed to take photos of the now lifeless robot. UNCANNY VALLEY will return later this season.